In his Swiss TV appearance, one will see many Swiss treasures that Alpen Schatz makes available to its customers around the world. 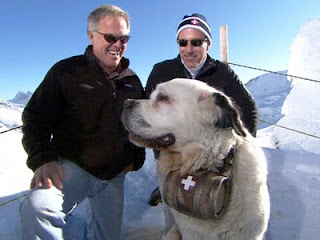 Note the "in" hat of the Alps that Matt is wearing, the popular Austrian brand called Eisbär, which Alpen Schatz carries in it's shop every winter. He also talks about the Swiss Cows with their classic Cow Bells, the most well known Swiss Breed dog, the St Bernard with its Swiss Keg, and traditional Swiss Yodeling, that is reminiscent of our Yodeling Marmots - whose pristine yodel is actually one of the top yodeler's in the Alps!